Most people prefer to live as independently as possible for as long as they can. If you’re taking care of an older relative, you’d like to help them achieve that goal, too. However, certain health issues can become obstacles to independent living, and sometimes your only option is to help your relative move somewhere else, such as an assisted living facility or a nursing home. This process can be challenging, especially if the new home is in another state. Still, just because it’s challenging doesn’t mean it can’t be a positive experience. Roberta, a member of the PinnacleCare Team, worked with one client who needed to help his parents move from Florida to an assisted living facility in Chicago. She shared the experience, as well as some insights that may help you assist your loved ones during this transition. A: Do your homework and see what’s out there. You need to really understand the needs of your family member, and it helps if you have support and make sure you’re not tackling this on your own. All family members need to help. 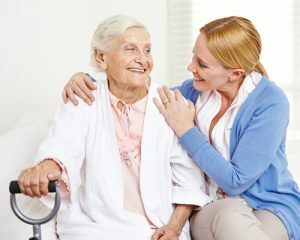 Additionally, you can turn to home health agencies, and even on the local and state levels, there are eldercare organizations that provide information. A physical and other assessments are usually required before moving into assisted living. The father had a physical one month before the move, so he did not want to repeat those assessments before the move. We helped make the transition to assisted living smooth by ensuring that he didn’t have to undergo redundant or unnecessary medical assessments. Q: What’s the best way to keep a person’s medical information together during the transition? A: Whatever facility a client moves to needs up-to-date information on what the person needs – medications, equipment, physical therapy and so on – to ensure continuity in care. At PinnacleCare, we collect, review, organize and securely store all our clients’ medical information electronically and, with the client’s approval, make it immediately accessible to any physician or specialist who needs the information it contains. A: There are some normal stages of adjustment. It’s going to take some time. Be sure to address anything out of the ordinary. For example, if someone isn’t eating, talk to a nutritionist about bringing in their favorite foods. Be sure to watch for signs of depression, and if there’s anything unusual, you may need to talk to a social worker or physician at the assisted living facility. Moving is a huge change, and you can’t expect your loved ones to adjust overnight. But you also want to identify any real problems that need to be fixed. Q: How can the health advisors at PinnacleCare help tackle the challenges associated with the transition to a new home? A: We really step in and partner with families. We understand what goes into any type of transition. We set up anything that’s required. We can work with case managers to assess safety in the new setting, measure independence, find out what’s needed and communicate directly with physicians for any orders on medications or equipment. We teach family members to be proactive and not wait for someone’s medical condition to become worse. We help clients understand how facilities function and who the players are. It’s a very collaborative and comprehensive process. We have a great deal of experience helping families make this transition, so we can help our clients manage every step. To learn more about how health advisors can help your family with transitioning an older relative to a new home, click here.